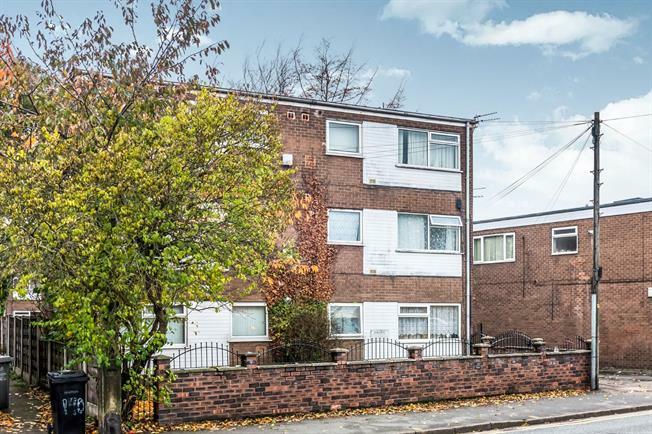 1 Bedroom Flat For Sale in Sale for Guide Price £100,000. Guide Price 100,000 - 110,000 A one bedroom second floor flat located in a gated residence and within easy reach of local amenities and transport links. The flat sits in one of two blocks and has communal grounds and parking via the electric security gates. Briefly comprising entrance hallway, lounge, kitchen, bedroom and bathroom. Enter the property through the communal entrance floor and stairs lead to the second floor where the flat can be accessed via the front door. The entrance hallway has carpeted flooring, ceiling light and gives access to all rooms. A carpeted reception room with electric fireplace being the focal point. There is a uPVC double glazed window to the front elevation. Fitted with a range of built-in wall and base units; the kitchen comprises stainless steel sink with mixer tap and drainer, integrated electric oven, gas hob with over hob extractor and there is space for washing machine. There is a double glazed uPVC window facing the front, vinyl flooring, ceiling light. A carpeted double bedroom with useful storage space. There is a uPVC double glazed window facing the rear and the boiler is stored in this room in a cupboard. A three piece suite comprising low level WC, panelled bath with mixer tap, shower over bath, pedestal sink with mixer tap and an extractor fan. There is vinyl flooring and a ceiling light.